Cooks’ longer reception along the right sideline set up Todd Gurley’s 6-yard touchdown run. The Saints opened up a 13-0 lead with a pair of Wil Lutz field goals and Drew Brees’ 5-yard touchdown pass to seldom-used tight end Garrett Griffin on their first three possessions. New Orleans’ second field goal was set up by linebacker Demario Davis’ interception of a short pass that deflected off Gurley’s hands. While making the tackle, Los Angeles Rams linebacker Cory Littleton delivered a forearm to Hill’s head. No penalty was called, but Hill staggered off the field to be evaluated by the medical staff. Just before halftime, the Saints announced he was done for the game. Jonny Hekker’s pass to Sam Shields along the right side caught the Saints off guard on fourth-and-5. The play sustained a drive that produced three more first downs before Los Angeles stalled on running back Todd Gurley’s dropped pass inside the New Orleans 20. New Orleans used a little gamesmanship to sustain the drive after their third third-down failure in the red zone on three possessions to start the game. The first two ended in field goals. This time, they kept the offense on the field and drew the Rams’ aggressive front offside for the first down. 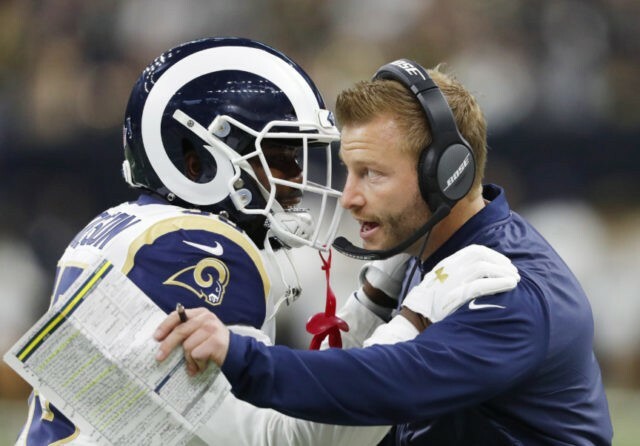 New Orleans’ second possession began on the Rams 16 after Jared Goff’s short pass over the middle deflected off running back Todd Gurley’s hands and into the arms of Saints linebacker Demario Davis. It marked the Saints’ second time in the Rams’ red zone, and the second time they stalled on third down with a short field. Wil Lutz, who kicked a 37-yard field goal on the opening drive, came back out to hit from 29 yards. There are no surprises among the Los Angeles Rams’ and New Orleans Saints’ inactive lists for the NFC championship game. The Saints already had ruled out receiver Keith Kirkwood with a calf injury that sidelined him during practice the past week. Kirkwood’s absence comes one week after he caught a critical fourth-and-2 touchdown pass in New Orleans’ comeback victory over Philadelphia in the divisional round. Also scratched from New Orleans’ lineup is veteran tight end Ben Watson, who has been ill this week. He is in the Superdome with the Saints and even could be seen stretching on the field, raising his prospects for returning if New Orleans advances to play in the Super Bowl in two weeks. Saints: TE Ben Watson (illness), WR Keith Kirkwood (calf), DL Tyrunn Walker, OL Will Clapp, LB Manti Te’o, OL Derek Newton and RB Dwayne Washington. That was the 2009 season. Some nine seasons later, coach Sean Payton and 40-year-old, record-setting quarterback Drew Brees are back with a largely different cast, one victory away from the team’s second trip to the NFL’s biggest event. When these teams met in Week 9, running back C.J. Anderson had not yet joined Todd Gurley in the Rams’ backfield and Los Angeles cornerback Aqib Talib was not healthy enough to play. Their availability puts the Rams in a stronger position than they were in back on Nov. 4, when they fell to New Orleans 45-35.